I took some time yesterday morning to put together a cute table. You all know I like to use what I have, so I didn't buy anything for it. I ended up with red, white, black, and sparkle! The fresh flowers I had on hand didn't work with the color palette, so I skipped them all together. 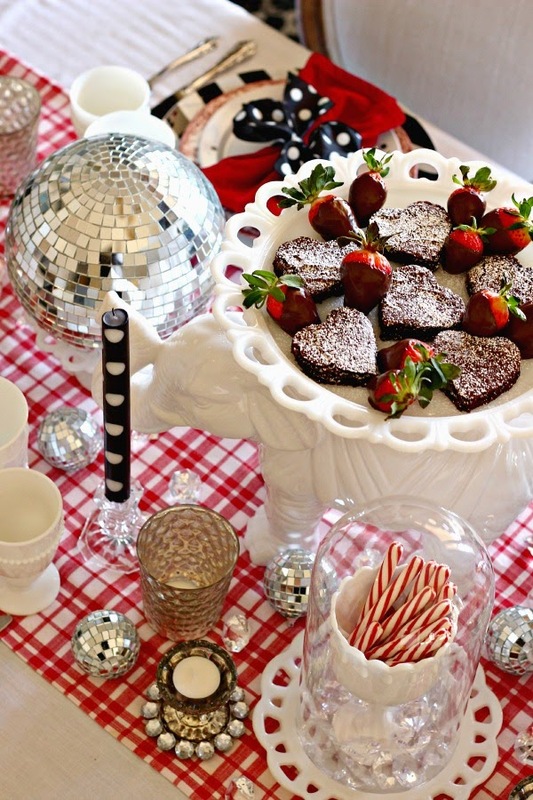 This cute guy fit the bill, and brownies make a much nicer centerpiece anyway, don't you agree? I used a few pieces of sticky-tack to secure the plate to the top of the elephant so it wouldn't get bumped off. I gathered up all of my silver and mercury glass votive holders, along with several milk glass pieces. Oh, and disco balls! Big and small, the room was sparkling as the sun went down! There are some acrylic gems scattered around as well. 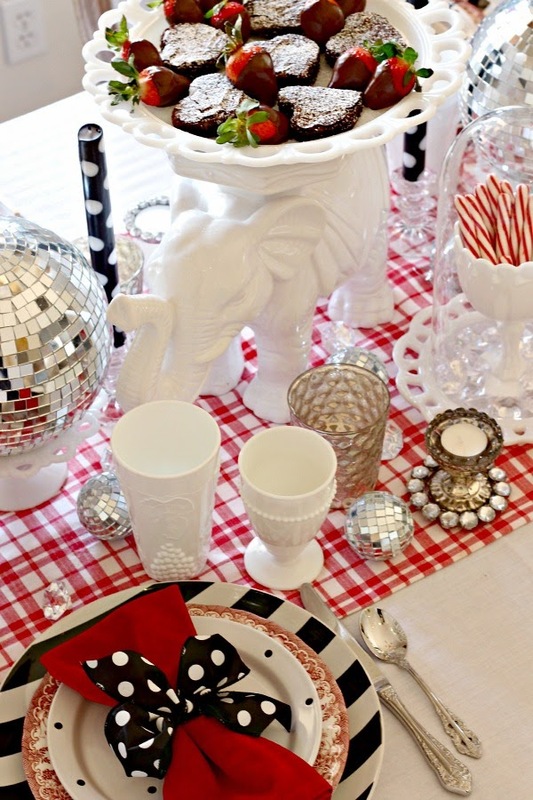 The black, white, and red table fit right in with the new spotted chandy shades. The kids each received a small bag of a few of their favorite treats and some new pencils for school. Mechanical pencils...they love them. 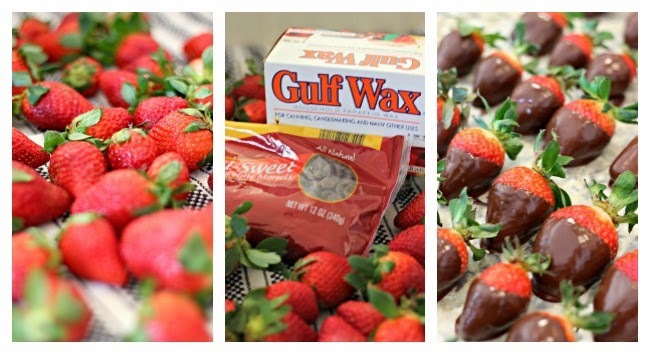 I hope you've made Chocolate Covered Strawberries before, but if not, they are so easy you have no excuse not to! I use the same method with the chocolate that I do when making my Chocolate Covered Coconut Bon Bons. 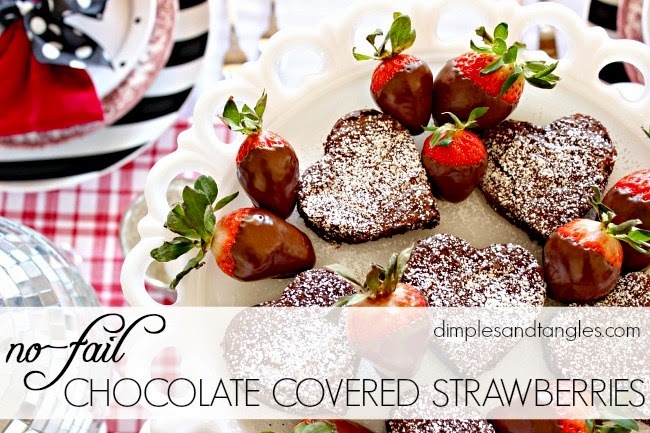 I love this recipe because the chocolate forms a bit of a hard shell and sticks well to the strawberry. All you need is a bag of chocolate chips and about 1/3-1/2 of one cake of paraffin wax. This amount of chocolate will cover about 3 pounds of strawberries. First, wash the strawberries and allow them to dry thoroughly. 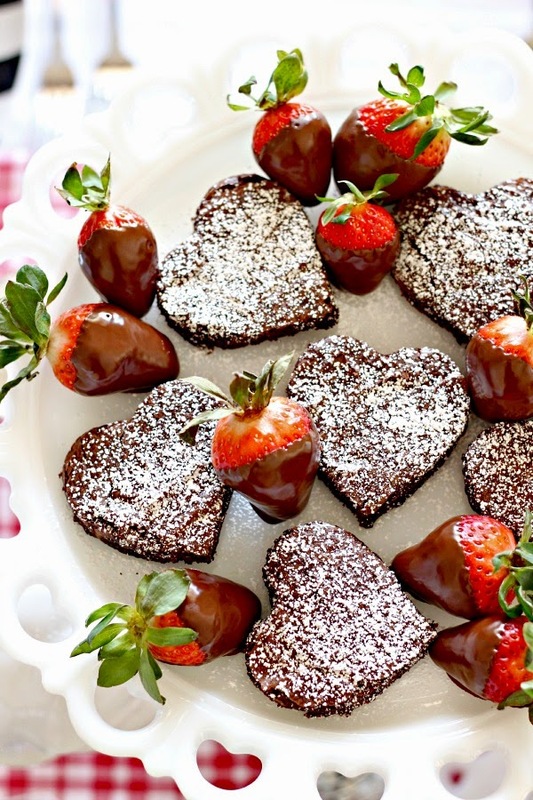 Melt the chocolate in a double boiler (more detailed instructions on that here), hold the strawberry by the leaves, then dip in chocolate. Lay on a sheet of wax paper and allow chocolate to harden. That's it! I hope you have a special day with your favorite people! 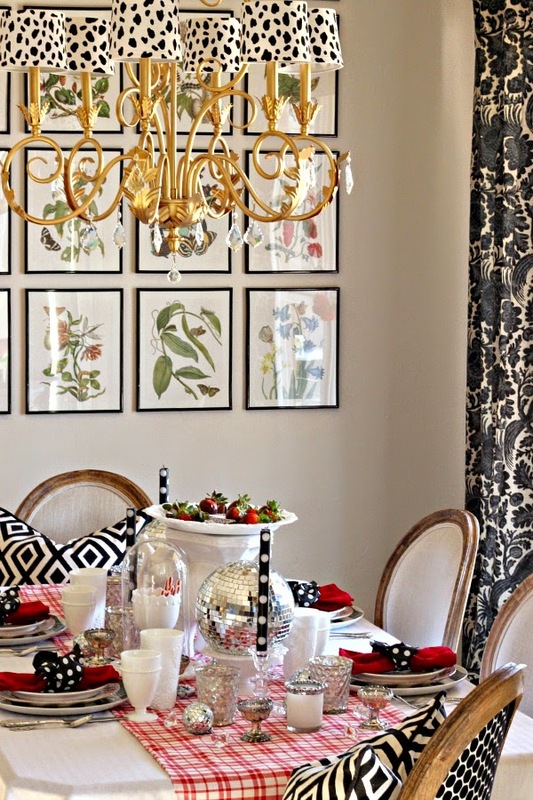 Love it all, what a fun tablescape. Love, love, love the elephant and the disco balls. Thanks for the recipe for the Choc covered berries. I will definitely make some. Darling! We're celebrating with friends Saturday and making homemade pasta as a little couples event. I think it'll be so fun! Love your setting Jennifer! I try to makes Valentines special for my family too, only this year, we'll be out of town, so planning a simple one for breakfast tomorrow. Happy V day to all of you! I love the Elephant "cake stand"! So creative! 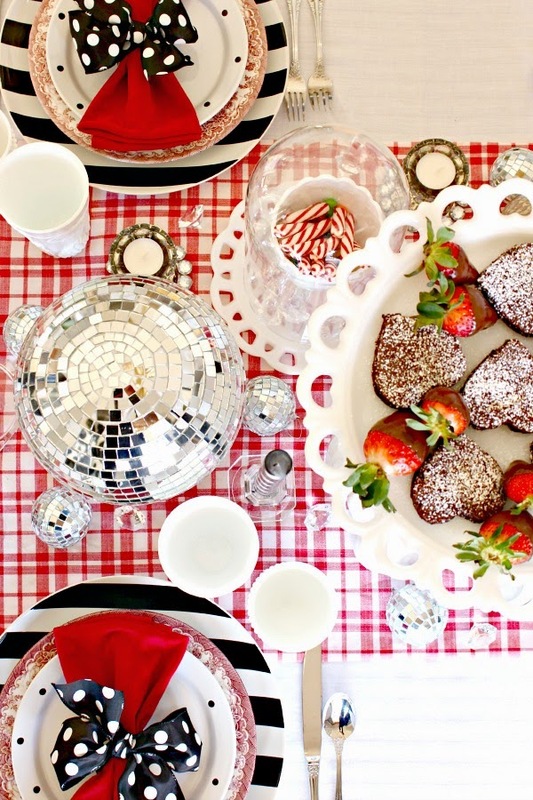 This looks fantastic and festive. 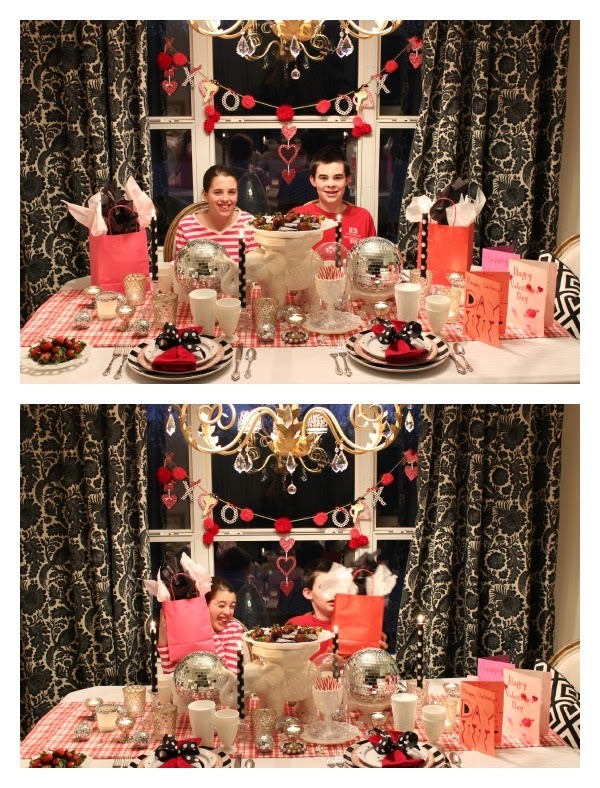 Our family will be having a Valentine's breakfast tomorrow to celebrate. Happy Valentine's Day! you are awesome and your home is so festive! i love it! Happy Valentines Day Jennifer and your adorable family! I love your fun ideas. 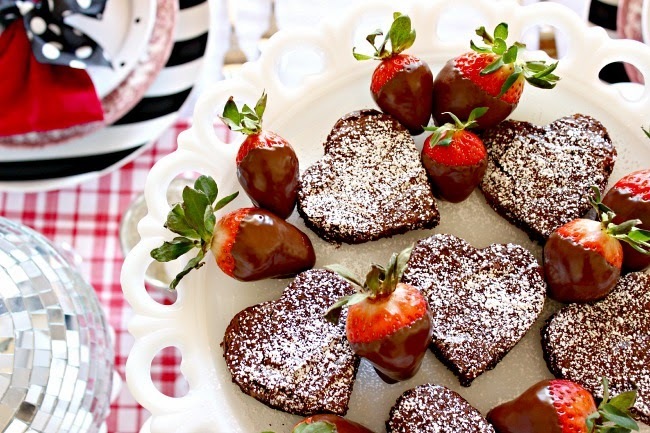 The heart shaped brownies are so cute and how yummy are those strawberries? I bet there were gone in one sitting. They don't last long in my house!